Why I Want to Eat at Friday's! Ever since my first visit many years ago, T.G.I.Fridays remains as my number 1 choice for Western food. So whenever B and I debate on What's For Dinner Tonight, TGIF is topmost on our list of suggestions. We both know that a visit to TGIF means we'll definitely come home happy and satisfied! One of the many things I love about TGIF is the warm and inviting ambience it exudes, complete with dim lights and upbeat music to help you relax as you indulge in the delicious jumbo cocktails and American food it serves. TGIF is also an ideal choice for any occasion. I've had first dates here as well as Valentine's dinners, birthday parties, reunions with friends or just a cosy night out with B, and every single one was great! 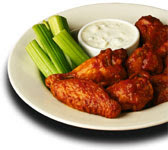 TGIF serves many delicious appetizers but my favourite is definitely is the Buffalo Wings! Coated with a special hot n spicy sauce, they taste simply divine with the accompanying blue cheese dip. I've tried the buffalo wings at Chilli's but those are served with a different kind of dip, so they come only a close second for me! I recently discovered a new item at TGIF and it's now another TGIF favourite of mine. Presenting...Cookies n Cream! Doesn't it look heavenly? I had this dessert during my birthday dinner with B this year and I have to say that it's probably the best I've ever tasted! Just one bite of this sinfully sweet dessert and you can't help but want more! 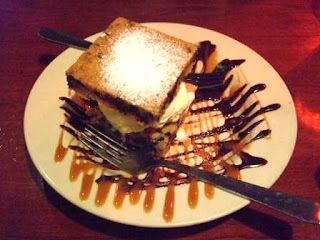 Imagine rich vanilla ice cream sandwiched between 2 deliciously chewy chocolate chip squares laced with hot fudge and caramel sauce...simply irresistible! Whenever B & I are away on one of our travel adventures, I'd make sure we visit the local TGIF there, if there's one where we are. 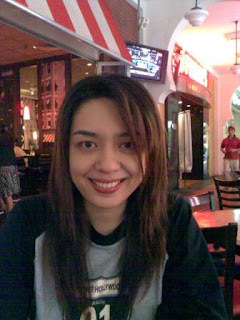 This picture was taken at TGIF Melbourne, Australia during our vacation several years back. Don't I look totally at home in front of the TGIF signboard? And this one was taken at TGIF The Curve in Damansara several months back. From my grin, I guess you can tell that I'm one happy camper to be dining at TGIF! Over the years, TGIF has impressed me with marked improvement. The service is now even better, the dishes tastier and the menu even more varied! So for the very fussy customer like me, who tends to throw tantrums if the service is not up to par and expects only the very best when she dines out, there are 3 things that I require from my favourite restaurants - ambience, excellent menu and impeccable service. TGIF has all three...and that's Why I want to eat at Friday's! Happy Friday everyone and here's to a wonderful weekend ahead! I must try the TGIF in Singapore then. With such recommendations from you, who won't think of dropping by for a good meal? Have a Good Weekend Marzie!! Hi Karen! Thanks for being my first commenter! I love TGIF's buffalo wings too!!!! Yummy:)You are right about the dip! I just can't imagine you throwing a tantrum! Ha ha ha...I used to work at a TGIF's! If I was your waiter I'd make sure you two had a perfect meal! MMMmmmm Cookies and Cream looks divine for sure! Hi Bobby! Oh I throw tantrums all the time LOL, but only when things really, really make me mad! ;) Like I said, I'm one fussy customer! The pics do look yummy esp my cookies n cream! Ooh you're making it sooo tempting, how to Puasa like this??? To be frank, I haven't stepped into a TGIF restaurant in my entire life ... so sad right? Anyway, anyone reading this will definitely end up at one, that's for sure. marzie!!! you've came up wt the post already!! and the TGIF ad is still on. congrates!! :) nice write up! i am sure you're gonna win this!! your post makes me wanna go to TGIF tonight! Hi Nihal! What? Never ever been to TGIF? For that, u MUST go with ur family soon, you've been missing out on a whole lotta yummies! Jean!!! Yeah I know, I managed to finish this post while my ad was still running, thanks for noticing ha ha ha!! Ha ha ha... what big gorilla Janice? That's so funny LOL! Ah Marzie, Marzie, Marzie, how do you expect me to keep with my diet when you go and post such mouth watering postings like that?!!! LOL! To be honest, I haven't been to TGIF in ages and I live so nearby even ... must try it out soon ... Happy Monday. Marzie are you sure you don't work for TGIF or something! This fre publicity you're giving them should be making you some moolah so you can go more often! That dessert looks mighty tempting lah! How to keep up with my diet if you keep promoting such great food! I'm already hooked on Tony Roma's bleu cheese burger! GK forget the diet!! Raya is coming and we need to indulge ourselves in some good food! LOL! You know, I've not visited Tony Roma's since the last time I recommended the blue cheese burger to u... kinda miss the onion loaf la! GP!! this was for NN kan?? did u win?? I want to eat at Friday's too!! GP!! Singapore got TGIF already at Orchard Road!! though I've not gone to it YET!! alamak! I nak buffalo wings itew! gonna wait for husband to come back and ajak makan TGIF today! lol, but then again, I cooked oredi for today! sambal tumis ikan bilis dengan petai gitu! oklah, tomorrow lah pergi TGIF! hehehe..lol @ Kak Emila yg kekenyangan..makan kat TGIF tak today? I had a great time reading around your post as I read it extensively. Thanks for writing about this! You are really a great author of this article! Great writing! You are helping people to enlighten their minds in different aspects in life through your excellent writing skills! Thanks so much! I absolutely admire the author for attributing their time for this astounding article. Surely many readers can benefit on this topic. Thank you. Yay actually got some more pics but scattered in other food posts, this one I wrote for contest last time hahah tak menag pun boo hoo!! !